I brought a nasty bug home with me from my short visit with the kids. I appear to be on the mend. Oh dear. I wondered if that was going to happen. I mean- how can you not kiss your sick grandchild? Oh feel better dear Yolie. That poem, especially the second stanza. Wow. And that photo. Is it yours? 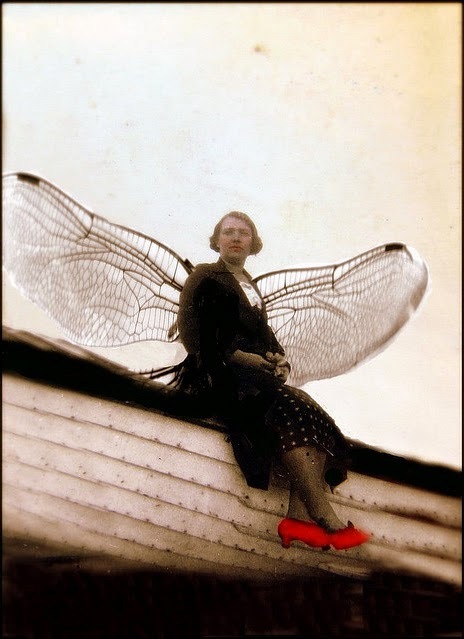 Amazing with the wings and the red shoes. Love. Thank you Mary Moon! You know. Angella, it isn't my photo but it fit and I could find no link to it's origin. I cannot resist red shoes. I'm breathless from all of it — the photo/collage (is it Tearful's creation or yours? ), the Neruda poem, etc. And I'm so sorry that you're sick. I hope that you're feeling better this evening. Thank you Dear Elizabeth. I am better this morning. I think. The image does remind me of Tearful but it is not his. That is the problem with the sick grands, the germs spread around. i'm glad you are feeling better. Kirstin, they are little germ magnets! I want health clearances for all of them next time I go! Or maybe I’ll wear a mask.